For their second sheet on between the wars FAA aircraft, Model Alliance has six more great subjects for you. As with the previous release, this one has a superlative instruction booklet with four views of all the subjects on the sheets. There is full markings information and a short historical brief on each type and the markings range from the silver and full color to the later camouflaged schemes. First is the Hawker Nimrod from 802 Squadron aboard HMS Glorious in 1936. This has the yellow and white diamond pattern on the upper wing. Next is a Swordfish in the fetching blue and red scheme as carried on the HMS Ark Royal in the summer of 1939. The Walrus is a spotter plane from 715 Flight aboard the HMS Birmingham as used on China station in 1938. For a camouflaged plane, there is the Skua of 806 Squadron that was supposed to be on HMS Illustrious. However in 1939 the ship had not yet been commissioned so it was shore based at that time. The last illustration is for a Sea Gladiator of 769 Squadron, also shore based and used for landing practice aboard HMS Furious. The original fuselage band has an incorrect white cut-out for the aircraft number so there is a small addendum sheet to replace it. Not shown on the cover is a silver Flycatcher with 402 flight aboard HMS Eagle in 1927. This aircraft has a black fuselage and upper wing band. On the center section of the upper wing is a red and white checkerboard. The decals themselves are superbly printed and have vibrant colors. Model Alliance provides sufficient roundels so you don't need to go scrounging around for spares as sometimes occurs with other sheets. 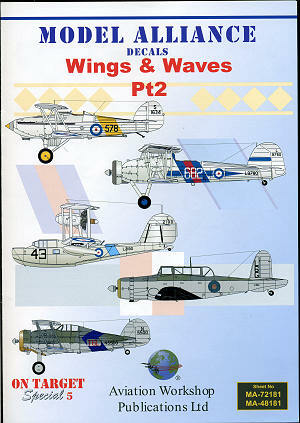 If you like FAA planes of this time period, then this is a set of markings you must have. Also available in 1/48.